HUGE uphill climb today on the way to Cebreiro, which will be our starting point into Galicia. I need to get better at “what are the odds” after Emily was able to shave an “E” into my leg. Games along the trail have also become common for our group, keeping us entertained on some of the more rigorous stretches of the Camino. Izzy also kept us entertained today with some 90s throwback music. After our second breakfast, we cleared the lower tree line to get an amazing view along the hills. Cebreiro was one of the only towns that we looked up from our walk to find ourselves right at its doorstep. This small 9th century town sat on top of a mountain, with circular stone buidlings and thatched roofing. While getting our room assignments, I was originally put by myself in the creepy attic room, which is slightly unnerving when you have been sharing a room with multiple peregrinos for the past week. But after a slight mix-up, I was moved to friendlier accomodations. The next morning was one of my favorites. As we walked along the mountain range into Galicia, we could see the coastal mist in the valleys, while the other side of the mountain was completely clear. One of the coolest things about El Camino is the lodging. Each day, our destination (being the lodging) is a place where the “trail-walking” ends, and rest and/or exploration begin. The hostels are so interesting to me because every single one is unique in some way. Our very first hostel, called the “Albergue de Jesus” was a small, homey place. It was what I imagined a hostel would be like…except for one factor that made it quite unique: the walls. When our group entered the main entrance, most of us were taken away by the words and drawings that surrounded the interior. There were quotes, signatures, funny sayings, posted dates, drawings…etc. The writing was in English, French, German, Spanish, Dutch, and other languages that I simply did not recognize, which is symbolic of just how worldly the Camino is. Some of my favorites included: “No blisters. No love” (Which we discovered to be true), “Buen Camino, You magnificent baboons!” and a neat portrait of Jesus wearing a crown of thorns. Each hostel presented something different that made it stand out, ranging from décor to owners, animals, and the interesting people that filled the rooms each night. To me, Albergues on the Camino are memories made easy. 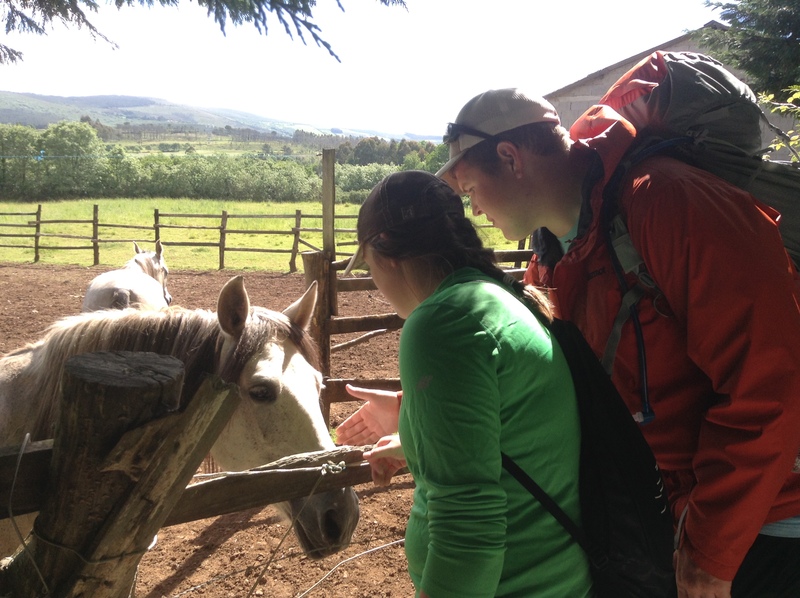 Six days into our Camino journey, one of the recurring themes I have noticed is communication. Pilgrims from all around the world who speak a myriad of languages walk the same path and stay in the same albergues. 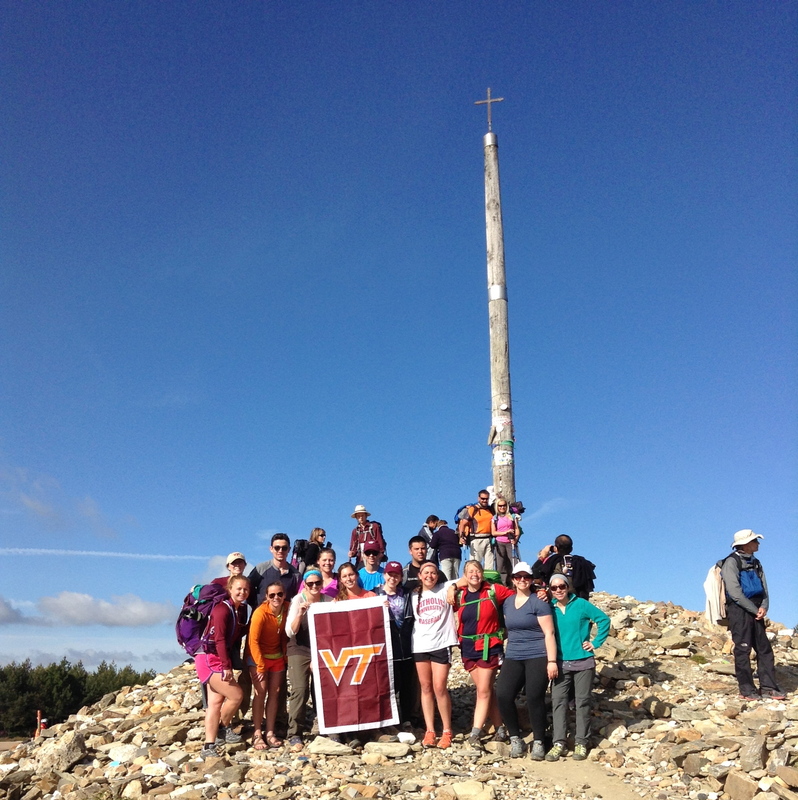 It has been interesting to see how the different places along the Camino handle the communication barrier. Many of the restaurants and albergues that we have been to post menus and signs in multiple languages, the most common of which include Spanish, English, French, German, and Italian. Most of the pilgrims I have met so far speak one or more of these languages, so the system seems to work pretty well. I have also noticed that the Camino heavily employs the use of pictures, especially on bathroom signs. The men’s room and women’s room door pictures are often very creative and vary greatly among the places we have been to. The other place where we have seen a lot of pictures is on the road signs. I know we have a lot of pictures on road signs back home, and they don’t seem out of place to me because I’m used to them. Here it’s different. Some of the pictures make no sense whatsoever, so we’ve starting making our own interpretations which are more fun anyway. Back on the subject of languages, it amazes me how many Europeans speak multiple languages. Pilgrims from all over Europe seem to speak at least some English, as do many of the Spanish locals. In the United States, most of the people that I know only speak English. I’m starting to realize how self-centered that mentality can be. We shouldn’t expect the rest of the world to speak our language. 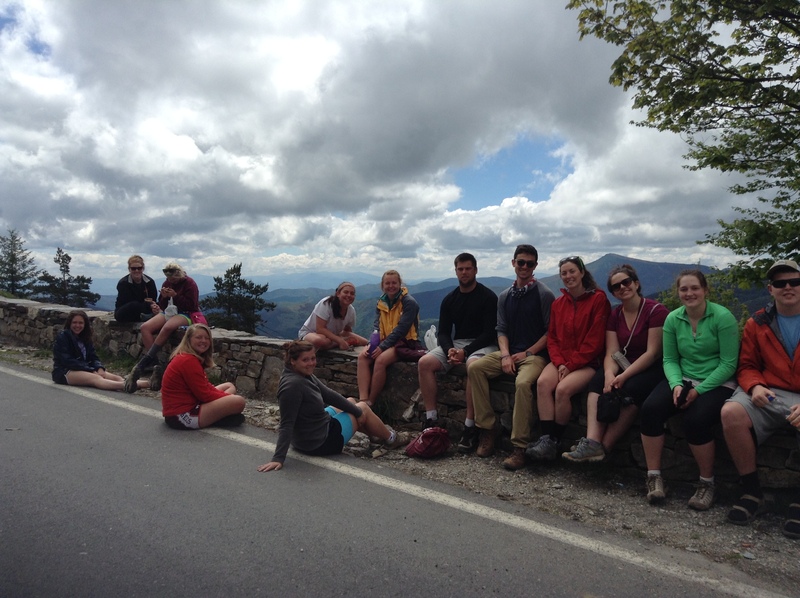 Speaking Spanish has made my Camino experience exponentially better so far. 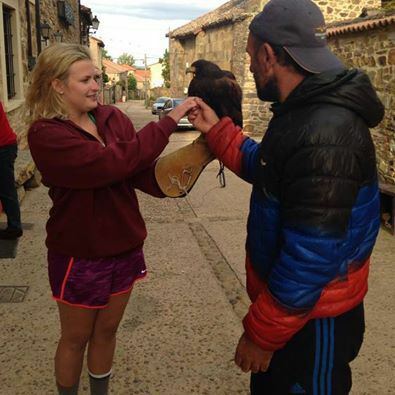 Many of the best conversations I have had have been with the locals in Spanish. Even though many of the townspeople can speak English, it isn’t necessarily easy for them. When people find out that we speak Spanish, they open up to us and are excited to share their lives and their towns with us. When Mary, Katie, Louan and I got to Astorga, we met an old man in a feathered cap who gave us a tour of the city before bringing us right to our albergue, all because we could speak Spanish. 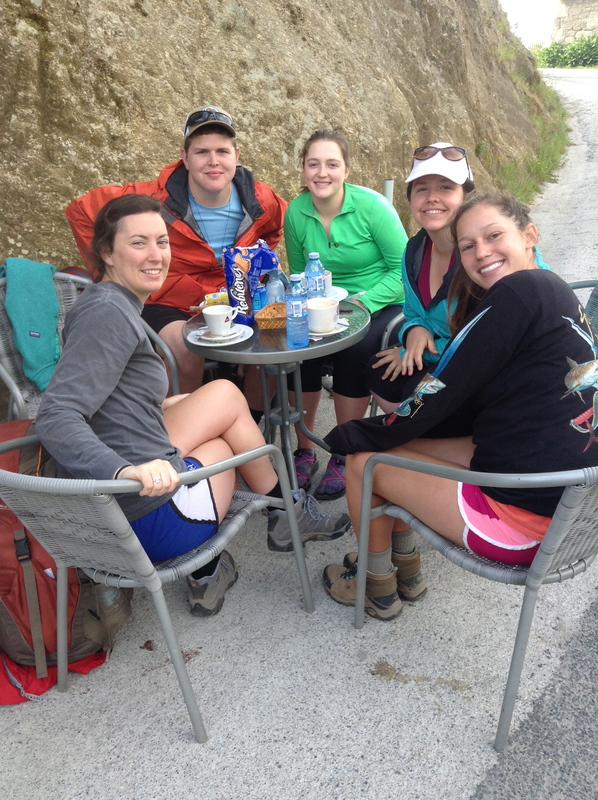 Although walking the Camino is a meaningful experience under any circumstances, I’m really glad that I am doing it with a group of people who know and are learning Spanish. This is the perfect opportunity to improve communication skills in Spanish and in general. I’m excited to see what the rest of the Camino will bring!